Last April, Master Phillipe de Lyon taught a class on pewter casting at the SCA event It Takes My Child to Raze a Village (an awesome event where children are the stars). 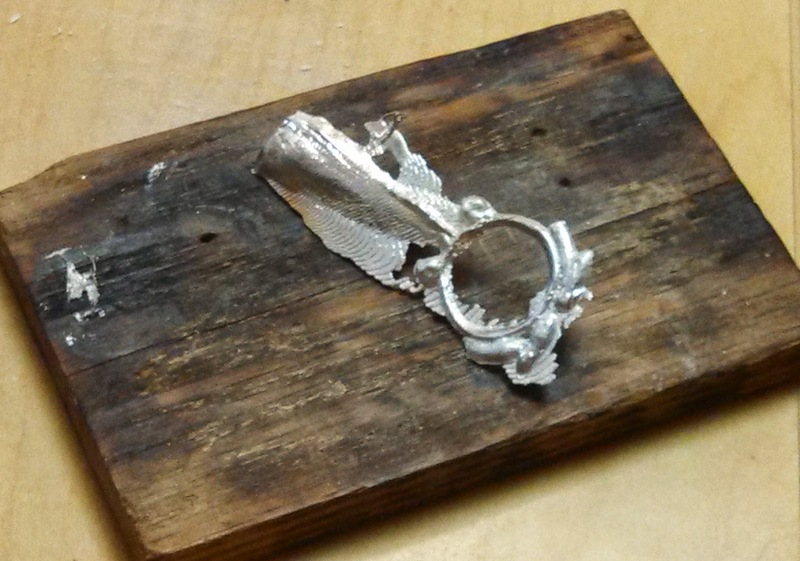 It turns out that you can do simple pewter casting with very inexpensive materials. I thought this was really quite amazing, so I took notes! There are even some photos and a video that my friend Heilve snapped with her phone throughout the class. 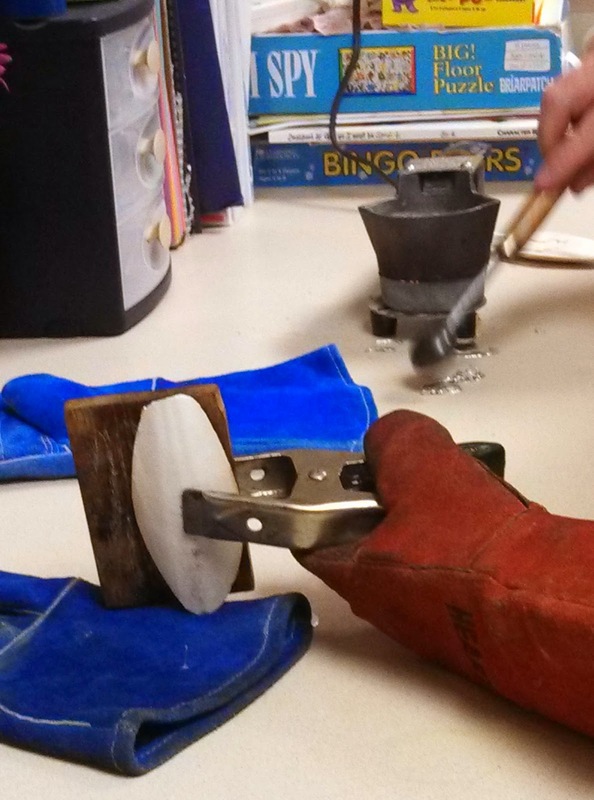 Pewter can be melted on the stove top, provided you're careful about not spilling metal on the burners. To melt it, you need a pot you don't eat out of, and a burner to melt it on. You can also use a camping burner or crafting burner/hotplate. Pewter: Look through garage sales and thrift stores for pewter candlesticks, plates, etc. British pewter often has a small triangle engraved/stamped onto the bottom of the item. 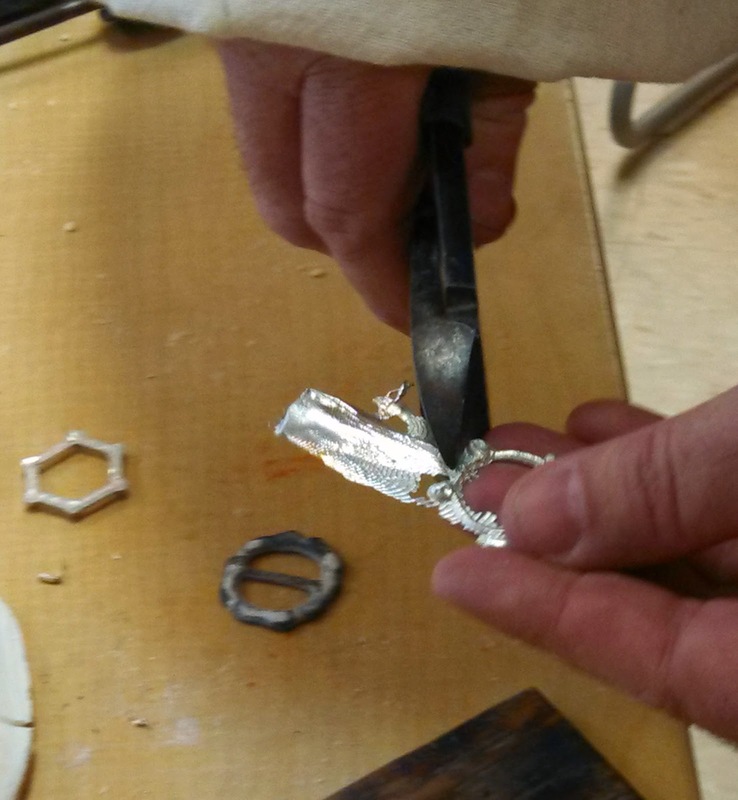 You can also try to cut the edge - I'm told pewter will cut, while aluminum won't. The mold will be made out of the soft flesh of the cuttlefish bone. First, you need to flatten the area on the soft side. Do this by rubbing the flat wooden board against the bone. Make sure you do this over a trash can - the dust smells like fish, and isn't something you want drifting around your home! Once you have a flat surface (needed to make a tight seal with the board later, so metal goes into your mold and not everywhere else), take the piece you want to make copies of. This could be a small buckle or pendant. Push that piece firmly into the bone with the wooden board, making sure that your mold is angled so that gravity will pull metal into all parts of it (the bone will be held vertically when the metal is poured). 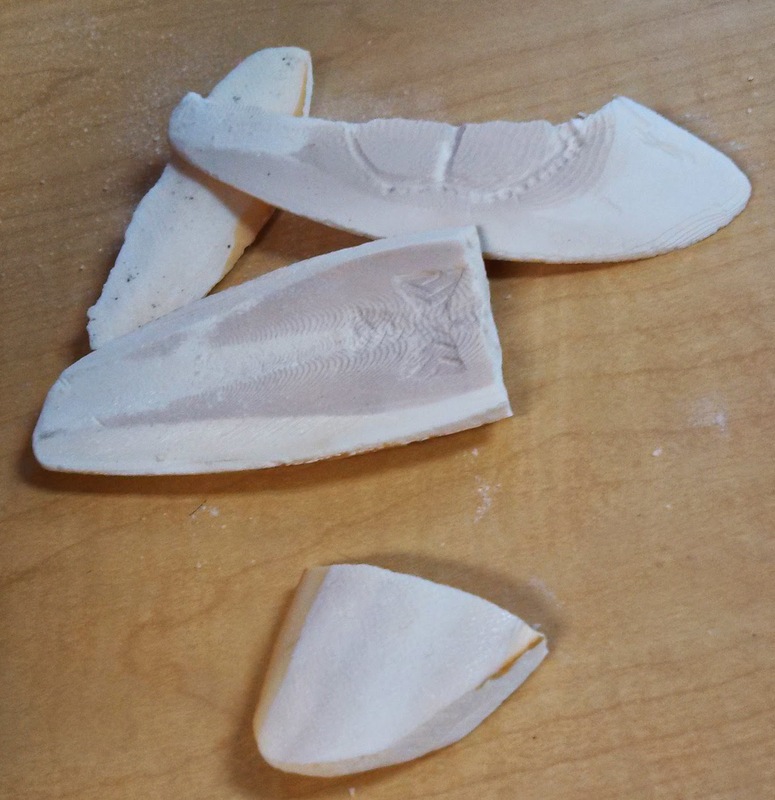 Alternatively, you can use your chisels to free-hand design a mold. After your piece is molded into the bone, you need to carve the spru. In the second bone above (with the cross pendant), you can see a funnel-like channel carved out from the mold to the top of the bone. This channel is called the spru, and it is where the metal will flow into the mold during casting. Make sure this channel is large enough to hold all the metal that your mold needs, as it will be poured very quickly. Hold the mold over a piece of leather. 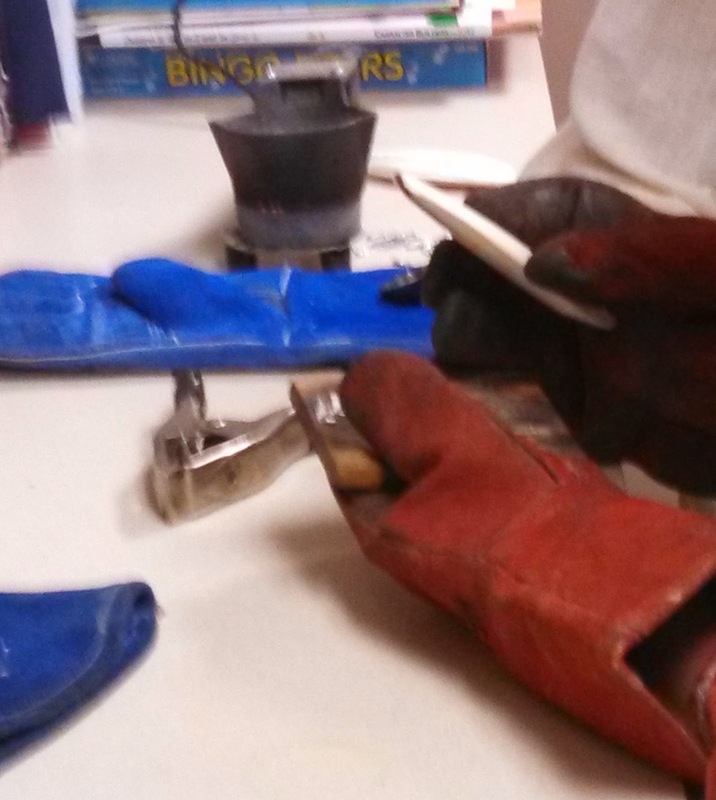 The metal that misses the mold will fall to the leather and harden quickly there. The leather might get slightly singed, but that's better than singeing the countertop. The molten metal will develop a film on top of it. Use the ladle to push aside the film until you get a dipper full of smooth metal. Simply pour the dipper full of metal into the spru at the top of the mold, quickly pouring it all in at once. Wait a couple minutes before opening the mold, so the metal has time to solidify. 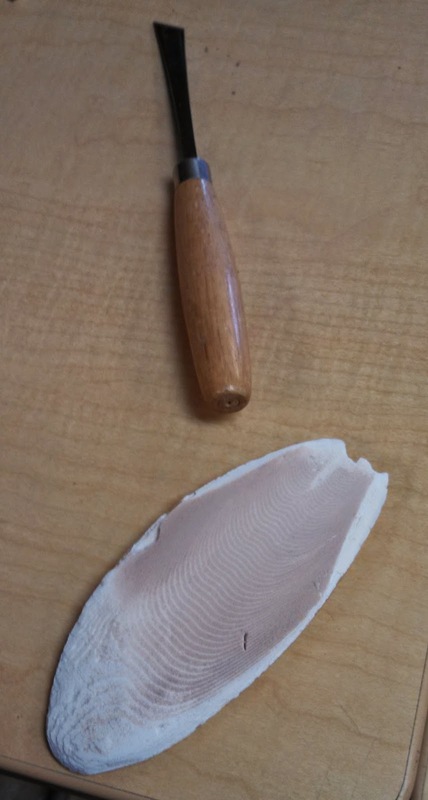 Then lift the cuttlebone off the wood block, leaving the metal on the block. The last thing you need to do is use wire cutters to cut off the spru, and files to get rid of any remaining metal burrs. It's really that simple! Young children (~elementary school age) learned how to do this entire process in the course of an hour, with a little help from parents, and went home with tiny metal pieces that they had made. I have some pewter pieces sitting around, waiting to be melted into something cool... what should I make? What would you make first?